Photo by J.D. Cavrlich 8/24/18 BAHS vs. Tyrone. Denver Light gets pressure from Shawn Wolfe. TYRONE — Tyrone dropped a 13-10 overtime decision to Bellwood-Antis in the 2017 season opener and never recovered, finishing with a disappointing 3-8 record. The Golden Eagles were determined to make amends this season and they did, knocking off the Blue Devils, 16-7, in the 2018 opener Friday night before the usual standing-room-only crowd at Gray-Veterans Memorial Field. “When you lose this game, it’s tough,” Tyrone coach Jason Wilson said. “You work all off-season for this one game and, if you don’t win, you’re into the heart of the schedule next week and it’s tough to rebound. “Getting this win tonight is big for momentum and sets the season in the right direction,” Wilson offered. 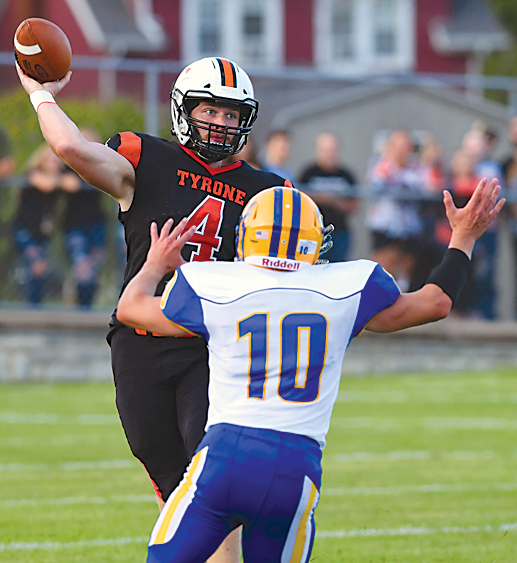 Tyrone’s offense was led by quarterback Denver Light and running back Zac Albright. Light passed for 221 yards and hit Damon Gripp with a 18-yard scoring strike that put the Eagles ahead, 13-7, early in the fourth quarter. Albright rushed for 98 yards, including a 7-yard TD late in the second quarter that tied the game at 7-all. The Eagles clinched the victory when junior placekicker Keegan Raabe booted a 21-yard field goal with 1:47 remaining in the game. Bellwood opened the scoring midway through the second quarter when sophomore Nick Plank dashed in from the 3 and Alex Schmoke kicked the extra point. A 42-yard completion from Shawn Wolfe to Andrew Hale set up the TD. However, the Blue Devils had trouble mounting much of an offense the rest of the night as the Golden Eagles’ defense limited them to 128 total yards. Leading 13-7, Tyrone put itself in position to run out the clock with less than four minutes left. However, Light hooked up with Cory Lehman for a 43-yard pass that put the ball at the B-A 6 and the Eagles eventually clinched the win on Raabe’s 21-yard FG. “We saw something earlier and thought we could take advantage,” Wilson said of his decision to pass late in the game. “It was a little breakdown,” said coach Nick Lovrich, who was in his first game as the Blue Devils’ new head man, having taken over for the retired John Hayes. “It was a mistake and that’s going to happen. There’s so much adrenaline in this game and it’s tough to focus on the whole thing. “If we had won, we would have won as a team,” he continued, “but we lost as a team. You can’t point to one play and say that was it. I’m proud of our kids. They never gave up and were playing hard at the end. “That’s the sign of a team that can overcome some adversity and that’s what we’re hoping for,” Lovrich added. Game notes: Light will play college football at Fordham. … Bellwood entertains Glendale next Friday while Tyrone visits Central. BA–Plank 3 run (Schmoke kick), 4:44. T–Albright 7 run (Raabe kick), :49.7. T–Gripp 18 pass from Light (kick failed), 9:11. RUSHING–Bellwood-Antis, Walker 7-34, Kost 6-25, Frederick 2-12, Plank 2-7, Wolfe 8-6, Noonan 1-4, Miller 1-(-4), TEAM 2-(-31). Tyrone, Albright 22-98, Light 4-15, Lehman 1-4, TEAM 1-(-2). PASSING–Bellwood-Antis, Wolfe 4-10-0-56, Miller 1-2-0-5. Tyrone, Light 13-21-0-221. RECEIVING–Bellwood-Antis, Mallon 4-19, Hale 1-42. Tyrone, Hicks 4-27, Gripp 3-71, Lehman 3-58, Homan 1-47, Albright 1-11, Reader 1-10.